The Cartier Ballon Bleu Stainless Steel Bracelet Unisex Women’s Medium Watch W69011Z4 is a fabulous choice if you prize practicality, style and durability. Its classic round case and stainless steel bracelet are given a futuristic and elegant edge, with the inset, fluted crown featuring a synthetic cabochon blue spinel crystal. The unusual way the minutes markers curve outward, with a cool, magnification-warp effect, to allow space for the date window, at the 3 o’clock position, also adds to the distinctive look of this timepiece. This is a watch that is attractive, as well as highly practical. It is a design statement; whose design proves it was made for people who need a watch, and not just another piece of jewelry. The case is water resistant to 30 meters or 90 feet, and since the bezel and bracelet are also made of steel, there are no worries with wearing this watch in the rain, during exercise, or while taking a dip in the pool, all things that are not recommended with a leather strap. The all-steel construction also ensures that this watch can take a few bumps and still look great. That’s a nice bit of reassurance for busy people on the go, especially since this is a high-end watch, which requires a sturdy investment. This timepiece also has large, black, highly legible roman numerals for each hour, as well as black minute and hour markers on the inner dial. The hour and minute hands are sword-shaped blue steel, and show up beautifully against the glowing silver-white of the dial. The deployment folding clasp keeps this watch securely on your wrist, just as well as it did when Louis Cartier invented it in 1910. This timepiece is also popular, on screen and off, with Hollywood. Jennifer Love Hewitt, stylist-to-the-stars Rachel Zoe, and bad girl Lindsay Lohan all love this watch. It looks great with casual, as well as more formal wear, and could easily be paired with one or two silver or platinum chain-link bracelets, or perhaps something with blue detail, to compliment the blue accents of the watch. Jennifer Love Hewitt wears the Cartier Ballon Bleu Watch. Steel fluted crown, set with a blue, synthetic spinel cabochon. Guilloché (engraving technique) silvered dial. Sword-shaped blue steel hour & minutes hands. 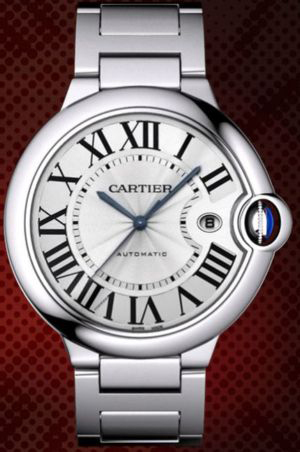 Cartier caliber 690 quartz movement, Swiss made. Water resistant to 30 meters / 100 feet. Case dimensions: 36.6 mm diameter, 12.05 mm thick. Magnified date display at 3 o’clock. 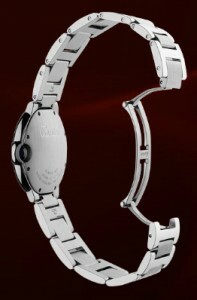 Bracelet length 6.5″ with deployment clasp. The main drawback that I can see in this watch is the retail price; at $5200, I would expect to see precious metals or stones somewhere in the detail. However, the construction materials are durable, the watch is elegant, stylish, and has a few very distinctive details in its design. It is highly readable at a glance, and it does carry the Cartier pedigree. If you are looking for a classic, luxury watch that is not too girly or bling-happy, this one could be for you. Another potential drawback is the weight of this watch. It weighs 1.8 pounds, due to its steel construction. This could be a problem for you if you have any wrist problems such as previous injuries or carpal tunnel syndrome. But, most people report that they get used to wearing a heavier watch within a week or so. There are several variations available within the Ballon Bleu Collection, including different sizes (small, medium, large) and different mixes of materials, such as steel with yellow or pink gold. You can also choose versions with various leather straps, and even a few chronograph (standard timekeeping and stopwatch features combined) models are included. They all feature the unusual inset crown and high legibility with a round case.